When Warren Wilkes, age 13, stumbles upon a mysterious relic deep in the Cascade Mountains (The Gaia Wars) wonder reigns. Brimming with secrets and sentient energy, the relic leads Warren to a fantastic chamber, and to shocking revelations about his identity. Now wonder has turned to dread. A forgotten terror-- a demon that knows Warren better than he knows himself-- has risen again and is gathering power with a singularly evil goal in mind: to capture and enslave the wild spirit of the Earth itself. Warren must fight or see all that he cherishes destroyed. First off, that cover is eye-catchingly wonderful. Many readers should be drawn in via the cover and their attention will continue to be held because of the action-packed plot. Warren now has another enemy to face off against, he must strive to save his small mountain town. Another interesting character is Warren's mother. She had the potential to provide a large amount of power to both sides, Warren and the "evildoers." Will Warren pull through? What is particularly intriguing and captivating about this novel is the intricate description of Uhlgoth and his army. The reader will be caught up in the terrible type of beauty the army possesses and the hard strength the reader will be able to feel emanating from the army and Uhlgoth. Another quality that would make this a great book to draw a reluctant male reader in. The author pays a good deal of attention to Uhlgoth, making the novel much more exciting and providing more action and hints of mystery. This second book in the series is exciting and fun to read. It was very hard to put down, many readers will finish within a day or two. The characters were very easy to read about, the dialogue was intriguing. The events were fun to read about and the plot was fast-paced. A reader can look forward to more from this author. The book had a very mystical, fantastical feel that reminded me of Pachabel Canon (I love that song!). This book is recommended to teen/middle grade readers, particularly male readers. Thank you for the great review! I love the layout and images you found. So cool. 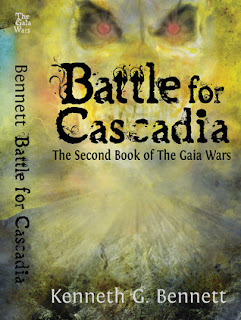 I'm thrilled that you enjoyed Battle for Cascadia. Thanks so much for your support during this tour!